I can say I had one of the most nerves breaking weekend as things went wrong one after another. The forecast was good for flying for Saturday and Sunday, Regina came from Germany and many friends have shown the will to fly. I was really looking forward for flying but already on Saturday work came across my plans so I had to do the work in the morning and at 1 pm I was able t run out under a high cloud covered sky. Regina was at Kovk, I went to the nearest take off Lijak. Nothing showed any good signs of lift but I said I have to go in to the air otherwise why all the rush all day. Rigged the glider fast, jumped in to the harness and took of. Nothing nothing, just a glide down close to the hill all the time. Last part I went out over some smoke, just to see if it is possible that fire underneath can make a beep in my vario. Well it did but just not enough for turns of course. That really ruined all day to me. 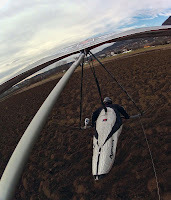 I de-rigged the glider very fast and went up to the take off as I presumed it fell off immediately as I took of flying low down the hill and then opened the glider. I called the phone which was still ringing. I cam back to the take off which has a really nice drop after meters, so we tried to hear something while calling the phone but did not heard anything. I went home to look at the pictures but I did not see it falling down at any of it. My guess was it must be at the beginning of the flight so I made turnpoints on my GPS with an idea to walk the track next morning. Dears, rabbits, you name it, everything was there just the sound of The naked and famous was missing. The ring I have on my phone that is thankfully really loud. After some km of walking and almost climbing, I realised I am losing the game. The last part was made over the rocks and quite high so my guess was phone can not survive 50 m drop down to the rocks or grass field. First thing I said to them I have no documents, no driving licence, no i.d. :D Yes, police man said, but you where too fast :/ As he had an excuse to write a bill he forgot about the documents and I drive further happy man with a 300€ bill. We went on to fly which was, well, winter like. After all bad things I was happy to land and have a glider in one piece. My head was just not right for this bubble flying. I cam home at 5 pm when I opened facebook, my only connection to anyone while not having a phone. I open my computer where my brother is sending me a text with, one guy called, he found your wallet, call him! 1 in a million chances that someone just walking could found my wallet. I called the guy and found his son, he said they went on the internet and found me :) Called home and whola, I got my documents back. Of course the idea was that maybe phone fell out at the same time. That was a place over one village whit vineyards around. He said they will left it in the bar where we used to go after the flying for a good pizza. I called for some nice help to search the phone in the dark. I came to the bar where woman showed me the guy who found it, by some coincidence he was there at this time. He was very kind and offered me to show where he found the wallet. We went up the hill where we got to a nice open grass field and started calling my phone which was still ringing. Two pairs of better ears then mine heard it little bit more down. After few steps I heard it too and could not believe that I actually will get it back after 2 days. It lay behind one small house on flat with out a scratch. It fell down 50 m for sure and survived with out a scratch. Unbelievable!